Ann Cornelisen wrote several books about the Italian south. 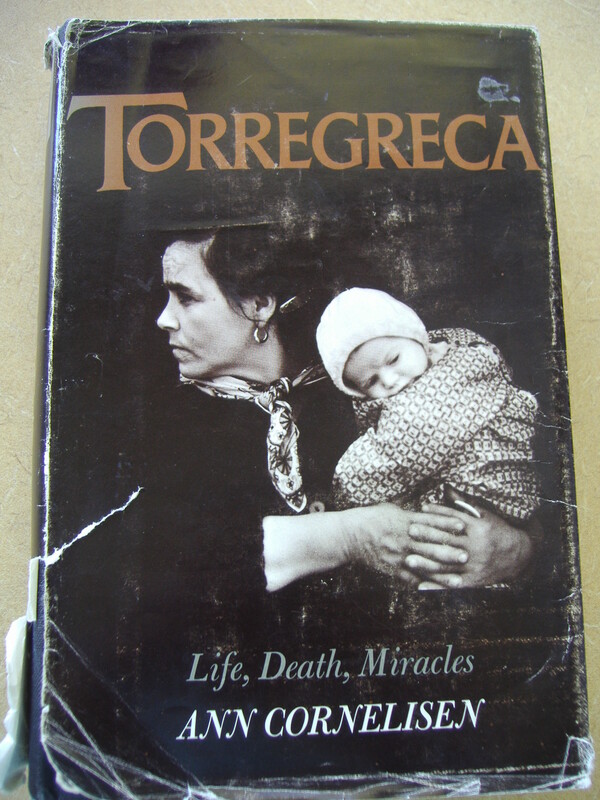 The best known is “Torregreca”, first published in 1969, and re-released in 2002 to further good reviews. Reading Torregreca brought me a new understanding of the emigrants of southern Italy. Her work, setting up nurseries for Feed the Children, was carried out in various places throughout the region. The living conditions, poverty, and social practices she describes in Torregreca are based on her experiences in a village in Basilicata, but apply to much of the rural south. She worked in the region for about twenty years beginning in 1954. The lives of many in the rural south at that time was unchanged from earlier centuries. Cornelisen’s books: “Torregreca: Life, Death, Miracles” (Little, Brown, 1969), ”Women of the Shadows: Wives and Mothers of Southern Italy” (1976), ”Vendetta of Silence” (Little, Brown, 1971), ”Strangers and Pilgrims: The Last Italian Migration” (Holt, 1980), ”Any Four Women Could Rob the Bank of Italy” (Holt, 1983) and ”Where It All Began: Italy, 1954” (Dutton, 1990). Her books would provide excellent background research for a historical novelist (like me) who wanted to set a story in rural southern Italy of an earlier era. I’m glad some of her books are available in new editions. They provide an insightful record of southern Italian culture for English language readers. I recommend her fine, clear prose and keen observations to anyone interested in recent Italian history. Only a couple of her books are currently in print, but all are available through used book sources. This entry was posted in Books, History and tagged Ann Cornelisen, Basilicata, book review, history, Italy, poverty. Bookmark the permalink. I completely agree. I just finished Torregreca and have also read Women of the Shadows. Cornelisen says so little about herself, yet I gained so much respect for her as a person, social worker and of course, writer. You see and feel the action and emotions through her eyes and heart.